The Philippines, Malaysia and Indonesia signed the agreement to designate a transit corridor for commercial vessels in order to prevent hijacks by pirates. Indonesia, Malaysia and the Philippines on Monday agreed to designate a transit corridor for commercial vessels crossing a maritime zone hit by a spate of hijackings by Islamist militants in the southern Philippines. Nearly 20 Indonesian and Malaysian tugboat crew have been kidnapped by the Abu Sayyaf militants this year, with Jakarta airing fears that the problem could reach levels seen off the coast of Somalia. Analysts say $40-billion worth of cargo passes through the Sulu and Celebes seas each year, including supertankers from the Indian Ocean that cannot use the crowded Malacca Strait. The three countries also agreed to step up air and sea patrols and escorts for commercial ships in the common maritime areas to fend off potential hijacks, kidnaps and robbery. 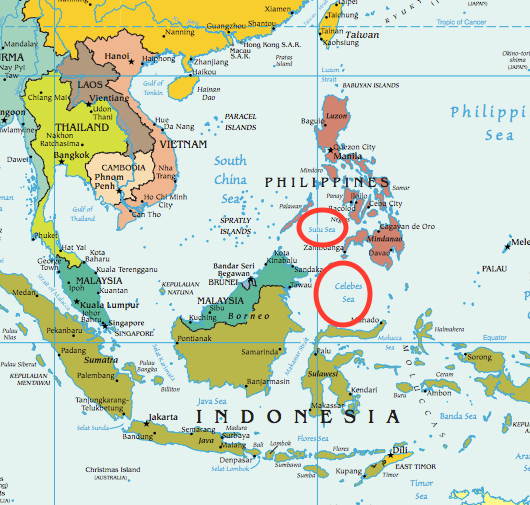 Philippine Defence Secretary Voltaire Gazmin said the leaders agreed to share the best practices evolved by Indonesia and Malaysia during a joint effort to patrol the busy Malacca Strait waterway against pirates, as a model for three-way cooperation with the Philippines. There was no immediate comment from the Abu Sayyaf rebels. Piracy near Somalia’s coast has subsided after shipping firms hired private security details and international warships patrolled the waters. It's a Reuters report. Love the "no immediate comment from the . . . rebels" bit.